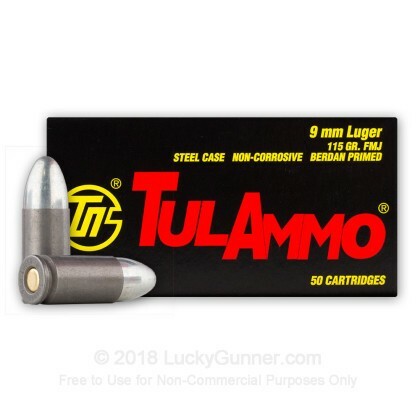 This newly manufactured 9mm ammunition is PERFECT for target practice, range training, or plinking. It is both economical and reliable and is produced by one of the most established ammunition plants in the world. The Tula Cartridge Works was founded in 1880 and is currently one of the largest ammunition manufacturing plants in the world. The Tula name has gained a following worldwide for its rugged, reliable, and economical product. This cartridge complies with CIP requirements and the casing features a polymer-coated steel casing with a non-corrosive Berdan Primer. The projectile features a bimetal jacket (contains steel and zinc) and a lead core resulting in excellent ballistics characteristics. Tula started using zinc plating instead of copper for several reasons, one of which is the cost, another is that zinc is a softer metal than copper, and should result in reduced barrel wear. I have used Tula in several different calibers. I have never had an issue with any gun for any caliber. I have shot thousands of these rounds and have maybe had a handful of issues that could have been gun related. Would recommend to anyone. I decided to test my two 9 mm autoloaders with this ammo. The two were a Beretta 92FS and PX4 Compact. Surprisingly the ammo was not any more dirty than most brass ammo I use. In addition I didn't see any malfunctions with either gun with this ammo through 100 rounds. It also had acceptable accuracy for range ammo. These are a great bargain for those looking for low cost training ammo and their range allows steel ammo. I do not know how good they are with other guns but for Beretta's primary 9mm autoloaders, this ammo will work fine. Good ammo for stocking up and cheep enough to plink with all around great ammo. Not all guns like this ammo but, my Ruger P-95 sure does!! Never jammed, grouping could be a little better but, what do you want, it's cheap to shoot these? Would use again for target practice. Had a number of misfires with my model 39 during qualification. Ammo shot great no problems with my SAR B6P 9mm. No jams could shoot this ammo all day. Very happy with the purchase of the amo. Ammo was fine and I had so much fun on the shooting range and no problems at all. Excellent packing and shipped very fast. Thanks Chris and Angela here from Lucky Gunner. shipment arrived quickly, ammo firing was flawless, great target ammo. I have shot 9mm tula ammo in my P89 for years and never had a misfire or a FTF the same goes for my 1911 SA 45. Overall good ammo for the price. Having shot thousands of these Tula branded ammo out of several differant arms ,I have never had an lssue with feeding or firing.Sig 2022,Smith 3rd. gen 908,and a high point and Kel-Tec. cabine buy with confidence.If I can't shoot cheap steel case ammo out of a gun,I'd get another gun.I need to know that if all I can get is steel case ammo,my weapon will handle it.The steel case myth lives on but it is very soft or mild steel and I can crush a empty case between my fingers as easily as a brass empty.I prefer not having ti pick up brass.I hate reloading but love shooting. Will buy this brand again, had no problems. Ammo was just fine although these were bought as a gift for a friend. Ammo was well packed and shipped very fast. No problems encountered with either my Ruger P95 or Beretta PX4 Storm. Only one FTF in over 600 rounds. It's great range ammo. Unlike some others, both my pistols will eat this ammo all day long without problems. No problem dealing with luckygunner. Always fast shipping and delivery on time. Beretta PX-4 Storm is not compatible with this 9mm ammo. Steel cases will bind in the magazine and the gun won't feed. When these mis-feeds occurred at the range, I emptied the mags and reloaded with brass case ammo and bingo, absolutely no problem. If you regularly disassemble your magazines and clean them you might be OK. I did that, and the Tula rounds subsequently fed fine . . . but doubtless it would only be a matter of time before the light lube present after cleaning would wear off and mis-feeds would begin again. Note: brass cases are 'self-lubricating' i.e., the brass soft surface microscopically wears off with friction allowing the brass case stuff to feed just fine. Steel cases are not 'self-lubricating'. The soft steel will burr at the contacting points and drag on the adjacent magazine feed guides (in the presence of zero lubrication) and eventually bind. Your risk if you buy this stuff and some night need the 9 for PD. Important - these rounds are Berdan, not Boxer primed. Reloaders - be aware of this issue. Lucky Gunner has a good info page on Berdan vs. Boxer primers. Not a single problem. Would buy again. Seemed like I sent a little more time cleaning after but no big deal. My Star eats this stuff up! Great value! Great for range firing practice. Have had no problems while on the range. just bought my first pistol. needed to find some good ammo and not one that would cost a arm and leg. 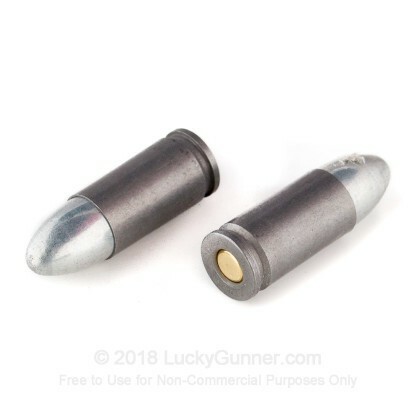 went online found luckygunner.com. the rest is in the books. have shot over 200 rds. no misfires also fairly clean ammo. the service was great. love how they keep in touch via e-mail. looking forward to my next order soon. Only ammo to stovepipe my Glock. Clean and accurate enough but had four stovepipes out of thirty rounds in a model 27 Glock with a 9mm conversion barrel. This ammunition does not deserve some of the disparaging terms you see on YouTube. For me, I do not plan to reload so simply putting the empties in the recycling bin works well. The ammunition is far more accurate than I am. Good stuff. Accurate and dependable out of a Hi-Point 995 Carbine. I just got back from some fun target shooting! I used Tulammo 9MM Luger in my Hi-Point carbine and my Glock 19. Once I got the carbine sighted in, the groups came in around 2" or better. Both guns functioned great with no problems. I really enjoyed not having to chase brass for future reloading. The ammo shot as clean as higher costing brands, which made all the more fun. Ammo came fast and worked well. I had one misfire, but that was it. I will definitely order from here again. I have an MPA Defender series 30SST in 9mm, it eats this stuff all day. No dirtier than Winchester white box, no FTF/FTE/ misfires, and the price can't be beaten. I've probably put a few hundered rounds through, and this is my go-to range ammo now. Shot several 50 round boxes of this stuff thru a Taurus 111 and a Beretta 92 FS with no problems at all. Never had a problem in my Taurus PT99. Shoots every time. Shot 500 rounds between a Smith and Wesson M&P and Ruger lc9. Never had a misfire or jam in either and accuracy was very good. Just ordered another 1000, its hard to beat the price for just target shooting. Also as they have a steel casing cleanup is very easy! Love this stuff, I had a few jams but I attribute that to my crappy beretta mags which are falling apart. I have no real complaints, it doesn't dirty up my pistol much, it shoots straight, (I am not a pistol marskman) and is dirt cheap. I would definatly recommend this stuff to anyone. It's certainly cheaper than standard brass ammo, the problem is I found it for cheaper at my local Walmart for $8.95 a box, which saves me about $24 total once you tack on S&H. I love Lucky Gunner and would recommend them to anyone but would also recommend you shop around first. I used 2 boxes ( 100 rounds ) with my glock 17. I first noticed it was different as I was loading my magazines. The Ammo did not slide in like brass, and towards the bottom of the magazine it took a great deal of force to get the last few rounds loaded. While shooting I experienced 4 Jams out of the 100 rounds. The Jams were caused by the steel casing not ejecting properly. I originally bought these because they were cheap, but after my experiences, I will not be buying steel cased rounds in the future. Brass might cost a couple bucks extra, but they are worth it. I have shot well over 1000 rounds of this ammo in 4 different 9mm I have.Have also shoot about the same of the 7.62x39. The ONLY problem I had is when the gun got dirty. I have had NO mis fires and chambed well from a 10 rounf mag up to 30 round mag. You can not go wrong for the price. Yeah, this ammo isn't the best you can get. But in my Taurus millennium it does just fine. I've shot about 1000 rounds through my gun 100 percent of them cycled through perfectly. 1 was a dud and never fired. 1 other didn't fire on first strike, but when I puled the trigger again it fired. Good cheap ammo for plinkin'. I thought I was getting a good deal. Let the buyer beware. My wife & me had many misfires from the 150 we fired. Nobody wants the cases after using this ammo. I would much rather pay $1-2 more per 50 of US made ammo instead of Russian ammo. This is all I shot at the range. GLOCK 17 1,000's of rounds yet not one FTE or FTF. Can beat this for the price, plus by it been affodable it keep you going back to the range. BE SAFE! I've shot Wolf/Tula quite a bit [thousands] and find it to be reliable and hard hitting. I would recommend it. Every time. Feeds great in my S&W Sigma. Always goes bang. I've shot over 1200 rounds of this stuff in 9mm, .380, and .45 calibers in three different 9mm (Ruger P95, Beretta 92FS, Stoeger 8000), three .380s (Bersa, Beretta 85FS, LCP) and a Ruger SR1911 without a single problem. Not a single FTF or FTE. It's seems to be just as accurate as Federal or Winchester too. A little dirtier than WWB but about the same as Federal. Coated steel casings have been used since the 1930's so most modern guns should have no problem using them. I have had consistent problems with this type of ammo. These steel casings seem to drag when you're loading ammo into the clip. I have a 19 round clip and after 10 rounds I find it very difficult to put another five rounds in. The service ability of the ammo is questionable. The first 200 rounds fired resulted in three misfires along with several chambering and ejection problems. These problems are not the result of a faulty weapon. This is an ammo I would not recommend. Put 500 rnds through my brand new ruger SR9 with not a single jam or stovepipe, I haven't shot handguns really before but the accuracy seemed pretty good as well, mostly did rifle stuff in the past but the grouping I considered to be relatively tight for my first trip to the range shooting from 15-25 yrds. The main thing I was warned about by the range operator concerning the ammo was that the bullets were coated in a resin that had a tendency to melt when it got hot, and if you didn't clean the weapon well with a steel brush the build up could eventually become a big pain. But that's just part of routine gun care, if you don't clean your gun you deserve for it to get jacked up no matter what ammo you're using. Great Deal! Great bang for the buck. Not gonna work in every pistol. I thought I had found a great deal on some plinking ammo for my Taurus PT92. Wrong. 3 -15 round clips and jammed 2 to 3 times per clip. Smokestack and tilted jams. I then tried a clip of IMI that I carried in the gun to the range and it shot perfectly. Probably just a bad match with this gun since others were having little to no problems. The rounds do well except for one problem, the steel case will wear the feed ramp. I shhot a lot of 9mm through my SW M&P and use Federal 115gr which cost about $1.50/box of 50. The Federal has a brass case and is made in the USA not Russia. Perfect for target shooting, and at the price you can buy a ton of it! 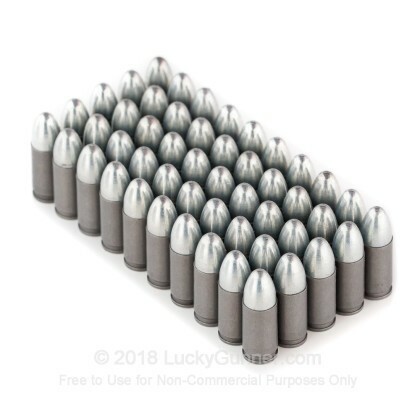 I purchased 7 boxes of these and I had to finish them in two sesions to get rid of them and I hope they didn't damage my 9mm. I was the center of attraction at the range because:(1) these bullets made my 9mm jam 3-4 times out of 8 rounds (2) an experienced person next to me showed me on the target that my shots were hitting "sideways", in fact it didn't leave perfectly round holes on the target instead elongated, cylindrical holes! 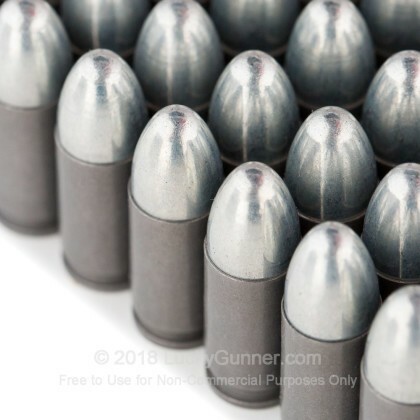 (3) one time a round didn't explode even though it had the neddle printed in the center primer(4) one bullet had half of the primer center. According to the experts at the range those bullets are very bad for many reason. They're made in Russia! if I would have known that before I would have spent more. I don't recommend them and good luck. With myself and both of my boys shooting IDPA, and all three of us shooting 9mm, you can imagine how much ammo we can burn up during a match!! This Tula stuff fits the bill. When buying 500 - 1000 rounds at a time, it makes more sense than reloading. Besides, we aren't into tuning ammo for max performance......we just wanna shoot. This ammo worked great in my XDm 9mm,not one problem.Cheap money for target shooting. This Tula ammo lived up to its earlier reviews. Non-jamming, inexpensive and a great deal that was shipped AS USUAL, immediately! Keep it up, Lucky Gunner! I am in Texas and I used two boxes today 12-11-2010 to take my CHL class. The ammo feed through my Glock great. Best of all I spend a lot less on my ammo than a lot of other in the class. I've been using Tula rounds in my .40 Smith and Wesson M&P, my 9mm CZ 75B, and my .40 Bersa Thunder UC . The quality control looks outstanding and all of my guns have chambered this ammo with zero problems. The worries about residue buildup from the coating and excess wear from the steel casings are bunk in my opinion. 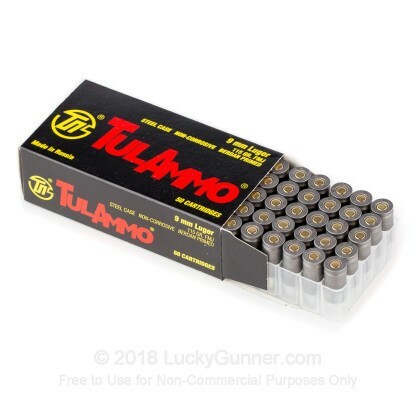 This is great ammo and shoots cleaner than Federal, Winchester White Box, and other low end ammo I've tried. Q: Is it non corrosive? A: Hello George, Currently all Tula ammunition is manufactured with non-corrosive components. They no longer produce any ammunition loaded with corrosive powders or primers. A: Hello Ra'Sean, Yes, these 115gr. 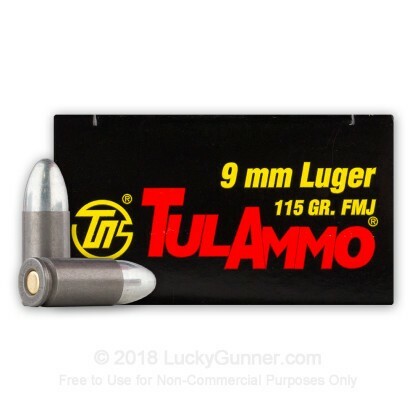 FMJ rounds by Tula in 9mm will work in your Ruger LC9. They do have steel cases so just make sure your range allows them. A: This ammo does meet United States standards and should function well in your Ruger P95. That said, this ammo is not American made - it is made in Russia and is steel-cased. Many shooters believe brass cased ammunition causes less wear and tear on your gun barrel than steel-cased ammunition does. A: Unfortunately, we are not able to ship ammo outside of the United States. We also have this 9mm - 115 Grain FMJ - Tula - 500 Rounds ammo in stock in a bigger quantity. We also have this 9mm - 115 Grain FMJ - Tula - 1000 Rounds ammo in stock in a bigger quantity.